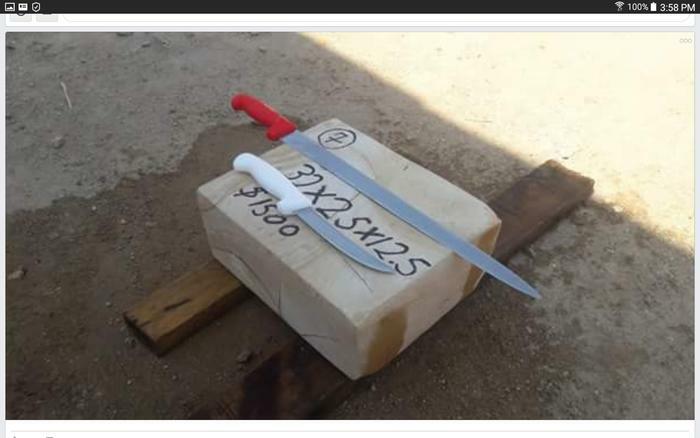 A couple of months ago a relative told me he had run across a man selling sharpening stones while on vacation. He said he was going to call me but forgot about it. I was pretty upset about it, as all my family knows I like to collect sharpening stones. His saving grace was that he liked it so much he was going back to visit places he had missed. He said he would be close to the town and would go back to the spot that had the stones. I gave him a good guilt trip and told him I would give him money ahead of time. He declined and told me to pay him after. Two weeks ago I got the call I was waiting for. Only problem was that he was not to be seen but that asking around one of the locals, a butcher knew his phone number. I told him to buy the biggest stone he could get. Two days later he said he had purchased the biggest stone he had and gave me his number. Tuns out the guy is really cool and told me that the stones are quarried by hand and shaped by hand with a chisel. He said the stones have been sold by one family for over 60 years and that he only sells locally to butchers and few highend chefs that have seeked him out word of mouth. He was proud of that fact and even gave me the number to a chef that had used them on Japanese knives. Needless to say I was impressed and called the chef. In talking stones and knives he stated he had over 20 Japanese knives and used Shapton stones on them. He stated that was his first natural stone but liked it very much as it was highly recommended by one of his coworkers. He said his favorite thing about it was the size and that it worked like a japanese stone in that he made slurry to start and then finished it with plain water. He even stated that it left a finish better than his 5k stone, closer to his 8k but not quite. He even stated it was his go to stone using it 90% of the time. Next day I was called and was floored when when he told me how much it weighed. A little over 26kgs, yes thats over 57 pounds! I could not believe it but I did say to buy the biggest one! Lol I have a few pictures I can look at and share until it gets here. When wet it has a nice yellow color! Size is in cm(32cmX25cmX12.5cm)thats 12 5/8 X10X5 inches! I have a few big knives and two machetes I can't wait to try them on! Hope it arrives in one piece, fingers crossed. ScottGoodman, Geezer, alpla444 and 15 others like this. That is a very big hone. I hope it makes it up to your expectations. Geezer and Toroblanco like this. That's a great story. Looking forward to an update when it arrives. What is the provenance of the hone? Very cool! But have you lapped it? I would also like to know where it is from. Is that price $15.00 I hope? Looks interesting, I would be interested to know the geographical origin as well. The stone is from Southern Mexico not from Monterey or the mollejon as it is known. They have a white stone I've heard about 700-1200 grit and a black one at about 4k-5kish. This one dries whitish but when wet becomes a very nice yellowish. The chef told me he puts it at 4k-6kish and seemed to know his synthetics. He sent me a video of him sharpening with his stone and stated it has become his favorite. He stated it was good for cutting meats including fish. He works at a very high end Restaurant on the Coast. They were recommended by another chef friend that had more expirience than himself and he was impressed and had aquired one for himself. He sharpens in a Japanese style and I can see in the video he has a good undestanding of sharpening, as he shows a close up and it looks nice and even surface. The price came out to be in the 80 dollar range. Not bad but they wanted close to 300 dollars for shipping. So I had it shipped to my Uncle that comes to visit a couple times a year. It will be some time before I get it but I have many stones to keep me busy until I recieve it. When it arrives I will gladly share. I don't have much more information on it besides what I have stated. The seller said it has been quarried for more than 60 years and it is known in his area and sought after by people in the meat trade and knife makers in that area. Which he informed me that their are many. He even stated that he only recieves up to ten a week but he only recieved two that week and none the week prior. They get big tropical storms that make it hard to reach the quarry, as it takes one hour and a half just to reach it in good weather. He does not ship out of the country as he just started shipping in country because of the word of mouth he is getting from the chefs he has sold to. That is what promped me to buy one as the the chef highly recommened them. In his video you can see that it cut fast and he made a slurry with a diamond lapping plate relatively easy but was not soft as he stated that he did not have to lap them as often as his Shapton stones. The seller sent some pictures of the quarry and them shapping the stones with chisels. I will ask if he will mind if I post the pictures. One last thing I would like to add was in pictures he sent me about a third of them, at least a quarter of them are round like a tree cut in sections and he said many of his clients mostly in his area preffered this shape but that all the chefs wanted rectangle shaped stones. I also noted sone had a realy nice wood pattern on them, really nice on the round shaped stones. I even told him that if he found a nicely patterned one to save it for me and he agreed. Very cool guy and even offered his home fore me to stay if I ever visited the area. Now that is hospitality! Stay Cool guys! rolodave, JOB15, MikeB52 and 5 others like this. rolodave and Toroblanco like this. He had smaller ones that looked like amakusa with many wavy bands. Looked like tree rings, I even told him to save me one like that in the future. 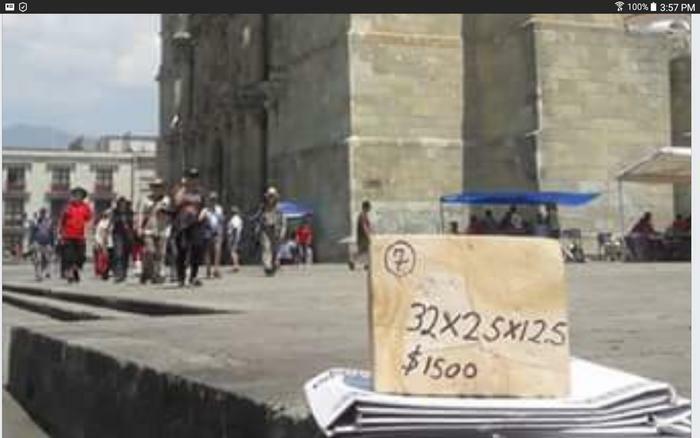 I talked to him and he stated that the quarry is 60km away from the the capitol city of Oaxaca, in the State of Oaxaca. He also stated that he was aware of a black sharpening stone and a brown one but did not know where they were from and that one was a river rock. He said quite proudly that his stones had the ability to cut faster and not glaze over while being finer than the two others. He said that is what made his more sought after by Slaughterhouses and butchers and those were his main clientel. The chefs were a new client that he did not know how it came about but he noticed they are buying more and more. He concluded it was because of word of mouth by the chefs. I asked for pictures of the quarry and said he would email me them later. I will share those once I recieve them. Man I can't wait to try this thing!